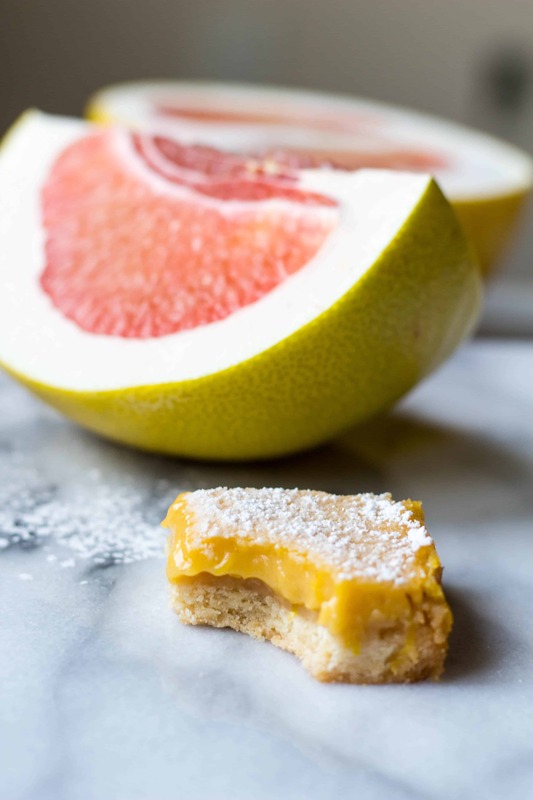 These bright, citrusy Pomelo Bars are like lemon bars only made with pomelo, which is similar to grapefruit. 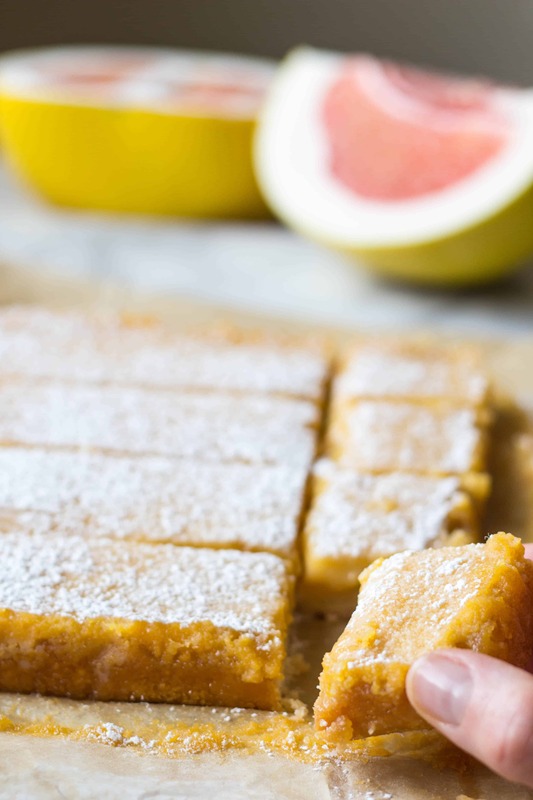 These Pomelo Bars have the best shortbread crust and a tangy, bitter-sweet citrus curd on top. To die for! What the heck is a pomelo bar? Allow me to explain. Let’s start by addressing the pomelo. It’s a large, bright yellow citrus fruit with a gorgeous, glowing pink interior, and super thick, pithy rind. They taste a lot like grapefruit, but are a bit sweeter and a little less bitter. 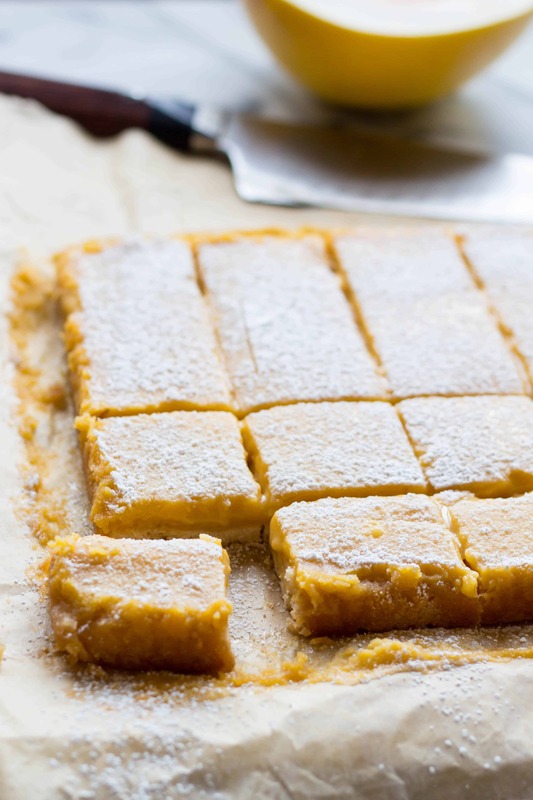 These bars are just like lemon bars, only they feature this less common citrus fruit instead. 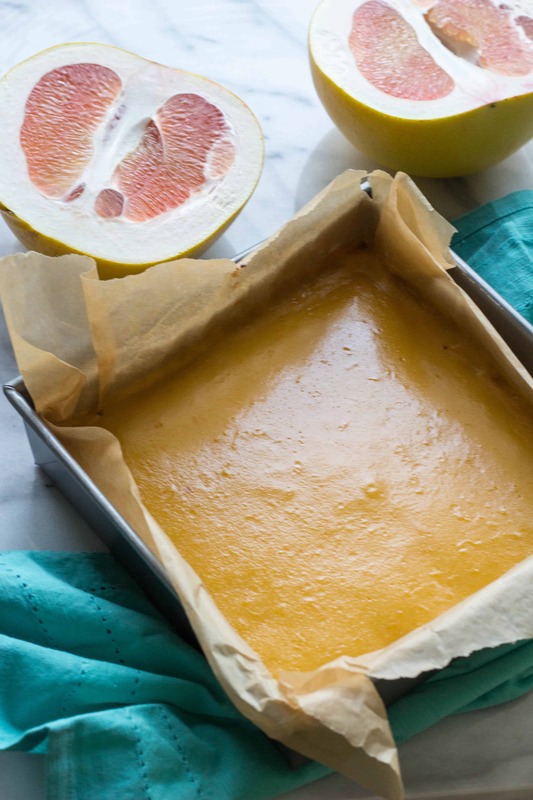 Lemon bars are universally adored, but pomelo bars are a grapefruit lover’s dream. …Which is to say, they might not be your dream. Grapefruit is one of those polarizing foods, up there with mushrooms, olives, coconut and beets. You either love them or your don’t; there’s no such thing as in between. The comedian Gary Gulman, who is not a fan of grapefruit, does a whole bit on how ridiculous it is that such a vile fruit can share a name with one of the most beloved and cherished fruits on earth: the grape. 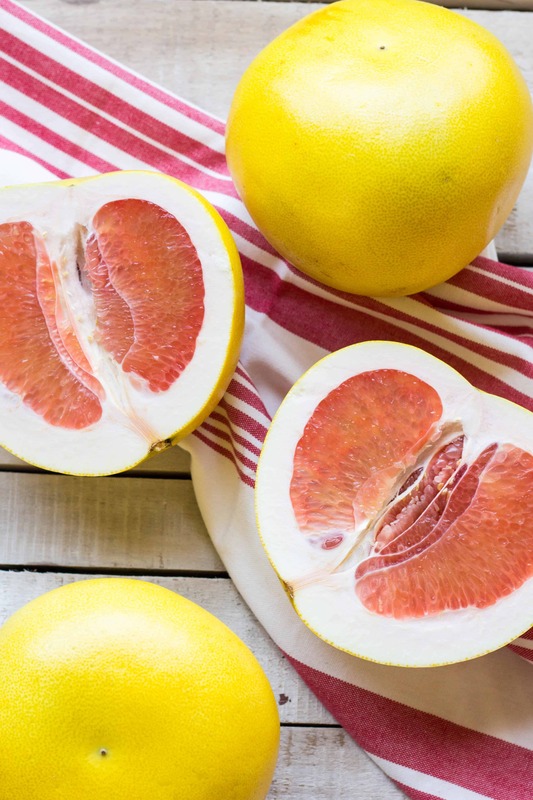 I happen to be a grapefruit lover, which is what first drew me to the pomelo. Recently I was walking through the produce market, when I was suddenly overcome with the most incredibly fragrant citrusy scent. I looked around and saw a large display of pomelos, and as I walked closer, I knew that’s where the beautiful grapefruit-like aroma was wafting from. I had seen pomelos before, but never actually tried one. Intrigued by their fragrance, I threw a couple in my cart and continued on my way. When I got home, I cut into one immediately. It was super juicy, and the little juice-filled capsules within the flesh were larger than any I’d ever seen in a citrus fruit. These babies were special, and I just knew I had to whip them up into something that captured their unique charm. I’m a big, big fan of lemon bars. 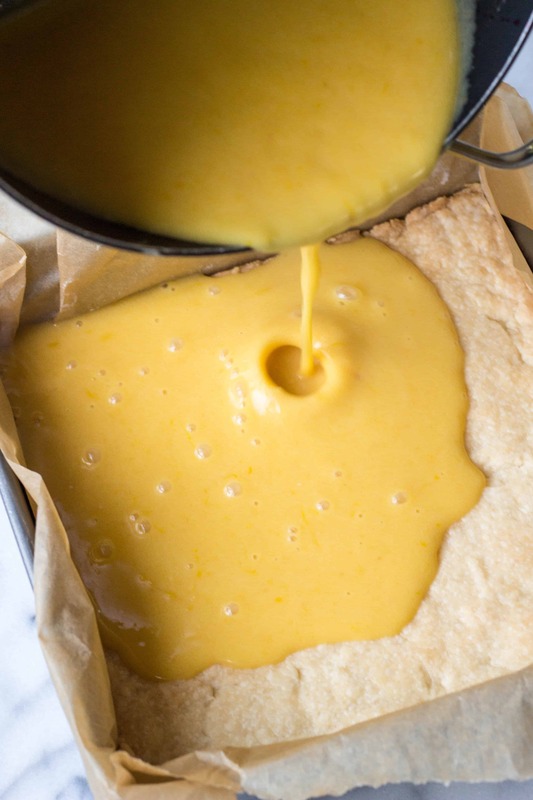 I love the buttery shortbread crust paired with that sweet-tart lemon curd top. In our house, we tend to favor the more puckery treats over the cloyingly sweet. I’m obviously a big fan of over-the-top decadent desserts, but when given a choice, I almost always opt for the lighter, fruit based sweets. These bars are just like lemon bars, only they pack a distinct pomelo punch. There’s a major grapefruity vibe happening here, but also some lemony floral notes thanks to a little help from our friend Meyer lemon. I wasn’t really sure how to first approach this recipe, so I looked to the interwebs for advice. I stumbled on this recipe from The Kitchn, and I used it as a start. It’s a pretty perfect recipe, so I only made a few minor changes. I loved the idea of adding Meyer lemon zest to make the flavor more complex, but also wanted a pronounced pomelo flavor, so I added in lots of pomelo zest, too. Arguably, a little too much. They were slightly too intense and bitter, so I dialed that back quite a bit for this recipe. If you can’t find pomelos, go ahead and substitute grapefruit. They’ll be slightly more tart and bitter, but to me, that’s not really a bad thing. If you don’t agree, you can always add another tablespoon or two of sugar to help balance that out. The real star here, I have to say, is that shortbread crust. 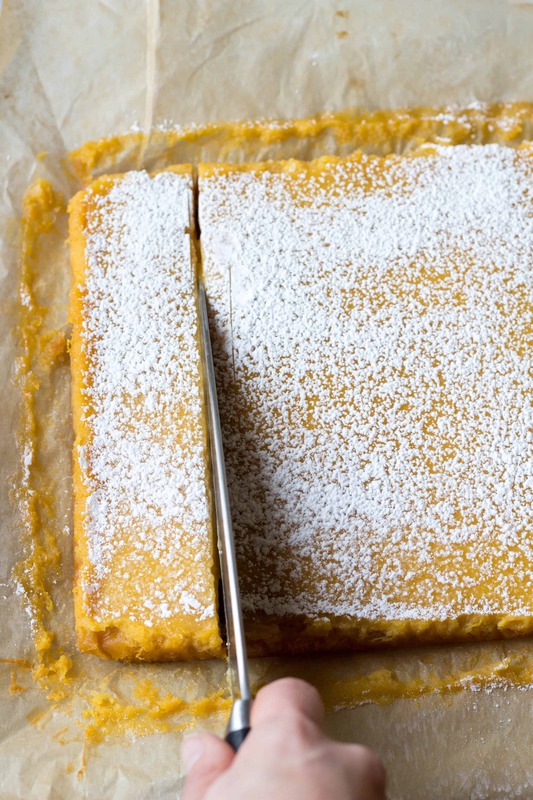 It’s perfectly buttery, not-too-sweet, and just melts in your mouth. I’ll be using this as a base for every single citrus bar I make henceforth, be it lemon, lime, grapefruit, pomelo, or some new and interesting citrus fruit I’ve still yet to discover. Preheat the oven to 325 degrees and line an 8×8 baking pan with parchment. Using an electric mixer, cream together the butter, powdered sugar and granulated sugar until light and fluffy, about 2 minutes. Add the salt and about half of the flour, then mix until just incorporated. Add the remaining flour and mix until barely combined. Overmixing will result in a tough crust. Empty the dough out into the prepared baking pan and press down to form an even layer. Bake for 30 minutes, or until the edges turn light golden brown. Set aside and allow to cool to room temperature. When the pomelo curd is thick enough to coat your wooden spoon, remove from the heat source and pour through a strainer to remove chunkier particles that will inevitably develop. Stir in the meyer lemon zest and pomelo zest, and set aside. Lower the oven temperature 300 degrees. 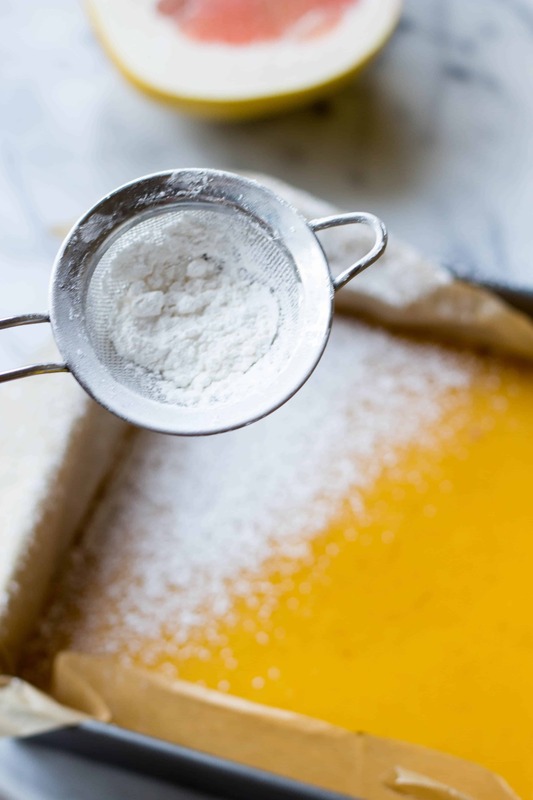 Pour the pomelo curd on the crust and spread it out evenly with a spatula. Bake for about 15-20 minutes, or until the filling is set, but still a little jiggly in the center. Allow the pomelo bars to cool completely, then dust with powdered sugar and slice into 9 squares. Serve immediately, or store, covered, in the refrigerator for up to 1 week. If substituting grapefruit juice, you may want to add an additional tablespoon of sugar to balance the bitterness. Whoa, what a good idea! My neighbor has a white-fleshed pomelo tree. Everyone compliments it when they walk by because it looks incredible with big bowling-ball sized fruit that weigh down the branches sometimes to the ground. He doesn’t even eat them. (I don’t get these non-grapefruit loving people.) Going to see if there are any left so I can make these soon! Thanks! Since posting this I’ve come to realize pomelos come in all different colors. I’ve only seen the big yellow ones with pink flesh inside. I’m sure they’re all super tasty though. I think you should definitely go snag some and make these. They’re so yummy!